Nine 5th through 7th grade girls showed up on Saturday, February 23rd, for Engineering Round Robin, hosted by the Illinois chapter of Society of Women Engineers (SWE). The idea was to pique the girls’ interest in engineering by exposing them to some of the different engineering disciplines, plus to serve as role models for them to show them that girls can be engineers too. Bioengineering freshman Saaniya Kapur’s parents never told her, “Oh, you're too young to do this!” Instead, Mom, who is preschool teacher, and Dad, who is a computer engineer, told her to go for it. So her early love of and exposure to science have shaped her dreams of a career in biotechnology. They have also fueled her passion for STEM outreach. Her goal? To give youngsters, as well as her peers, similar opportunities to fall in love with science the way she has. Excited about having some pre-Halloween fun with STEM, six local middle-school girls showed up at the Armory’s Innovation Lab on Tuesday, October 30th, for MakerGirl. During the two-hour session, the 7–10-year-old girls learned how to use Tinker-CAD, a computer-aided-design application for kids, discovered how 3D printers work, then 3D printed Halloween-related designs they’d made. Plus, currently all the rage and completely apropos for Halloween, they made some ooey-gooey slime. MakerGirl is a STEM education outreach program whose mission is to inspire girls to be active in STEM, to “live and dream as unstoppable forces that say yes to the challenges of the future.” Its ultimate goal? To channel more girls into the STEM Pipeline in order to foster “gender equality in all workplaces,” especially the STEM workforce. Several years ago, Laura Hahn (currently the Director of Engineering’s Academy for Excellence in Engineering Education [AE3]) stumbled across the book, Men and Ideas in Engineering: Twelve Histories from Illinois. On her way to show it to Angie Wolters (current Director of Women in Engineering), she had an epiphany, and determined, “Oh, I know what we have to do: we have to write a sequel!” So she asked Wolters, “Do you see this?” and at that moment, the idea for Women and Ideas in Engineering: Twelve Stories from Illinois was born. Avoiding the insanity of campus move-in day, 275 female freshman engineering students participated in the 16th annual WIE (Women in Engineering) orientation on August 21st– 23rd. Moving in early was a nice perk— they got to avoid being stuck waiting with mom and dad in a long line to unload one’s car at the dorm. However, most girls would say that wasn’t their main reason for coming. They hoped to get acquainted with campus, find out about their major and resources available to them, and to start building community. They hoped to see a familiar face the first day of class. What better way to get a bunch of middle school girls excited about Materials Science and Engineering than to let them explore color and making things pretty? That’s exactly what Mid-GLAM, named after its sister camp GLAM (Girls Learn About Materials) did by exposing them to different hands-on activities and design challenges. Mid-GLAM is a summer day camp for middle school girls interested in learning about Materials Science and Engineering. It made a second annual debut from June 25 – June 29 and served students from all over the state. On a fun, daddy-daughter date that was not just relational, but also educational, around 30 or so local fathers and their daughters showed up the Mechanical Engineering Lab on Saturday, April 7th, for SWE’s DADDS (Dads and Daughters Do Science) event. The event was geared towards having 1st–3rd grade girls bond with their dads while exploring science and engineering via fun, hands-on activities and challenges. The long-term goal was to pique the young girls’ interest in science and to encourage them that—like the Incredibles (the theme of the event) and supported by their real-life heroes, their dads—they too could someday do amazing feats in science and engineering. Most Thursdays, eleven middle school girls from Next Generation School can be found at the school’s brand new Science Social Café Club, chatting over lunch with local women who are scientists. Besides learning about different potential careers, as the girls hear how these women got to where they are today, they’re also absorbing some pointers about discovering their own careers. Some key ideas they’ve learned are: 1) If you discover that you don’t really like what you originally planned to do, it’s ok to change your mind. 2) You can fashion a career out of some very disparate disciplines. 3) If there’s something you love and are passionate about, you just might be able to make a career out of it. What do origami, tessellation, and string art have to do with math? Hoping to find out, a number of local 6th–9th graders participated in the GEMS (Girls Engaged in Math and Science) Workshops which ran for four Saturdays in a row (February 10th through March 3rd). Held in Altgeld Hall in the heart of the Illinois campus (and the Pottery Place in Champaign), GEMS allowed a group of girls to experience first-hand some of the ways math can play a role in art. And besides teaching participants that math is more than rote memorization and repetition, the goal of GEMS was to show the girls that math is all around them, to help them meet other local students interested in math, and to expose them to female mathematicians who might serve as role models. On Thursday March 9th, six MCB PhD students briefly put the work in their labs on hold to drop by the Science Social Café at Next Generation School’s STEAM Studio in Champaign. There, while a group of 11 middle school girls (and one boy) ate their lunches, they served as role models, explained a bit about how they ended up in science, shared what doing research as an MCB graduate student at Illinois is like, and described their career goals and other possible careers in their field. Plus, they were available to answer any of the younger students’ questions. The goal of the event? According to STEAM Studio Director Angela Nelson, it was to “break the boundary of ‘You could be a doctor, an engineer, or a lawyer,’” and open the youngsters up to the myriad possible careers, such as in science and research. On Saturday, October 7th, about 50 girls from all over the state of Illinois converged on Loomis Lab for Engineering Round Robin. Hosted by the Society of Women Engineers (SWE), the outreach program, with its appropos Robin (and Batman) theme, was designed to expose young women to different engineering disciplines. According to Katherine Kiang, a SWE Outreach Co-coordinator, they also hoped to &quot;provide them some perspective on what it’s like to do engineering as a career.” Designed for girls in grades 6 through 9, although high school students of any age were allowed to attend, the program was primarily targeting younger girls in order to get them exposed and interested at an early age. Engineering is not only fun, but can be used to help solve practical, real-world problems—even not-so-real problems— like finding Dory. This is the message Mommy, Me, and SWE sought to convey on Saturday, November 12th, to the 30 local middle school girls (and their moms) who participated. During the all-day event, mother-daughter teams were exposed to a number of the different engineering disciplines via fun and engaging hands-on activities that brought engineering down to a level the kids (and even the moms) could understand. While the old Irving Berlin song, “Sisters, Sisters,” may not exactly be the theme song of the two Pakeltis sisters, a couple of lines fit Grace and Abby to a T. One is the last phrase of: "Two different faces, But in tight places, We think and we act as one." For instance, they’re both studying Engineering at Illinois. Grace, the oldest, is a senior in Materials Science Engineering (MatSE), while sophomore Abby is in Mechanical Science & Engineering (MechSE). Devon Goszkowicz, a junior in Engineering, didn’t attend any STEM camps or outreach activities when she was little. However, one very important person in her life—her father—was an engineer. And now, here she is at Illinois, studying to become one too. And though she didn’t attend any STEM camps or outreach activities herself when little, she currently participates in several that expose girls of all ages and backgrounds to engineering. She's hoping to not just expose them to STEM, but to help them reach their potential, and to possibly even influence them to become engineers themselves. The week before classes began for the Fall 2016 Semester, 251 Engineering freshman women sacrificed their last week of summer vacation to attend Women in Engineering (WIE) Orientation on August 16–18. These future engineers showed up early hoping to get a jump start on the fall semester…and they did. Mother-daughter duo Cindy and Stephanie Richartz, the keynote speakers at the 2016 WIE Orientation (August 16–18), are both Illinois graduates. Both majored in industrial engineering. One major difference? While mother Cindy has been in industry and at Abbott for a while, Stephanie just recently graduated (May, 2015) and began her journey in industrial engineering. However, despite the difference in number of years in engineering, both were delighted to come back to their Alma Mater to share about their respective journeys—Cindy’s years of experience as a woman engineer in industry, Stephanie’s more recent experience at Illinois and finding a job. Both are also committed to giving back to Illinois, especially the Women in Engineering (WIE) program, to ensure that Engineering keeps producing a steadily increasing flow of bright young women engineers through the Illinois pipeline. Up to date on current research about STEM outreach, the Society of Women Engineers (SWE) at Illinois is aware that middle school is the crucial age to expose youngsters to STEM, and also that today’s young people want careers in which they can make a difference. So on April 16th, 2016, SWE held it’s first-ever SWE (Save the World with Engineering) event, an outreach that both targeted middle school girls and showed them that through careers in engineering, they can change the world. The Women in Engineering (WIE) organization in the College of Engineering prepares women to succeed in engineering. While a major focus of WIE is to help them be successful at Illinois, the organization also seeks to help them be successful beyond Illinois by providing them with the skills they will need to get ahead in their future careers. So in the 2015–2016 academic year, WIE leaders began a new leadership series called WIE Lead, which features monthly workshops highlighting students, faculty, and alumni who share their stories about how they've grappled with specific leadership principles. How did a little girl who had never been further than her home state of Texas and dreamed of being a veterinarian end up a researcher at Illinois, who also spends large blocks of time in Panama and is passionate about studying, in particular, the colorful Chelymorpha, or tortoise beetle? Lynette Strickland, an Animal Biology Ph.D. student who works in the lab of Illinois researcher Carla Caceres, credits the NSF-funded VInTG (Vertically Integrated Training with Genomics) IGERT. Twenty-six 4th–6th grade girls and their mothers (plus one dad) visited campus this past Saturday (November 7th, 2015) as guests of SWE (the Society of Women Engineers) to participate in the group's fall outreach event, Mommy, Me and SWE. The goal of the dozens of female engineering students who participated in the event was to pique the girls' interest in engineering and show them that, like their "big sisters," they too have what it takes to become engineers. Local girls who participate in the MakerGirl after-school program are doing more than just 3D printing objects they’ve designed. Little do they know it, but while sitting there tinkering on kid-friendly Tinker CAD (Computer-Aided Design) software, they’re learning to think like the big girls in STEM disciplines, such as engineering, do. And if MakerGirl has its intended impact, the fun, creative STEM-related activities will, like the Pied Piper, "introduce girls to the magic of science" and lead them straight into the STEM pipeline. 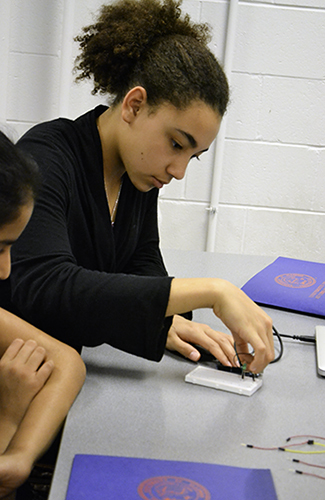 The main goal of Lara Flasch & Ashley May, the 2015–2016 Outreach Co-Directors for the Illinois chapter of SWE (the Society of Women Engineers), is to help youngsters believe that they, too, can become engineers. When Lt. Governor Evelyn Sanguinetti visited I-STEM on Wednesday, September 16th, she met with a number of like-minded Illinois folk regarding increasing the number of underrepresented students in STEM. During the dialogue, administrators, educators, project directors, and students alike shared their passion for STEM education and outreach, conveying this message to the Lt. Governor: the STEM pipeline at Illinois is alive and well. To get a head start on their first year in Engineering at Illinois, 257 young women attended the 2015 Women in Engineering (WIE) Orientation on August 18–19, 2015. One perk of participating? Getting to move in early to avoid the traffic jam that is move-in day. But more importantly, these freshmen got a head start on community building and networking with peers, especially in their engineering disciplines. Other WIE Orientation goals were to introduce the girls to key folks in their departments, acquaint them with campus, plus provide practical tips to help them be successful students. Kelsie Kelly’s goal in a lot of what she does is to pay it forward. A Ph.D. student in Community Health, Kelly has lofty career aspirations which appear to have been influenced by her own experiences. For one, she would eventually like to start a women’s clinic—no doubt influenced by the many outreach programs in which she participated growing up. Her other dream—starting a non-profit organization that mentors underrepresented students—probably came about because both mentoring and being mentored were so important early on in her life...and still are: "I have a bunch of mentors in Milwaukee whom I still talk to regularly to make sure I'm staying on track," she admits. Chemistry Merit Scholar and Nano@Illinois REU participant Arzeena Sultana Ali has never met a STEM subject—or STEM program—she didn't like. Exposure to science early on piqued her interest, and from then on, she was hooked. "I always knew I wanted to do science from a very young age," Ali admits. So it was just a matter of figuring out which discipline. Dean Susan Larson recalls that when she took over as the Director of Women in Engineering (WIE) in 2003, she thought, "The women need something to get started. They're a minority, but if they know one another, they'll be ok. They'll form a community; they'll make those connections." So, hoping to "bring them all together to get to know one another and get to know the campus and some of the instructors and advisors here," she started WIE Camp. As most of us are aware, our increasingly digital society has given rise to cybercriminals who can commit a crime with far-reaching impacts from anyplace the world. All they need is a computer and the internet. That’s why the newly-emerging field of Digital Forensics (DF) is so important. In order to catch and stop the bad guys, the good guys need to be just as good—maybe even better. The 27 middle school girls who participated in Pollen Power camp July 8–12 not only learned about the importance of pollen. They were exposed to the technology researchers use to study it, and to female researchers and graduate students, who both taught them and served as role models. In using mostly women, Pollen Power organizers sowed this seed that they hope comes to fruition in these girls' lives: they too can follow in these women's footsteps. Briana Chapman is a prime example of how exposing youngsters to STEM (science, technology, engineering, & math) at an early age can lead to a life-long interest—and possibly culminate in a career in STEM. Chapman, who attended GEMS (Girls Engaged in Math and Science) camp as a youngster, is not only helping coordinate this summer's edition of the computer-science-focused camp for middle school girls. Her career plans are "to somehow change the world"...via computer science. "This is the kind of camp that you'd want your own kid to go to." This was the impression of Nano-CEMMS educator Carrie Kouadio, who taught a number of sessions in this summer's 2012 GIRRRLS Exploring Science and Engineering Camp. Held in the heart of campus at the Campus Middle School for Girls, the week-long camp, which ran from July 30 through August 3, 2012, gave 28 rising fifth, sixth, and seventh grade local girls a taste of a variety of engineering disciplines. Tristesse Jones, a senior majoring in crop sciences and preparing to be a research biologist, followed the STEM education pipeline to the University of Illinois.